DC Shunts is used to measure DC current; it allows the measurement of current which cannot be directly measured by a particular ammeter. In this situation the shunt acts as a resistor of exactly calibrated resistance, it is placed in series with the loaded so that all of the current to be measured will flow over it, and it provides a proportional millivolt drop across its terminals in parallel which can be measured by ammeter. 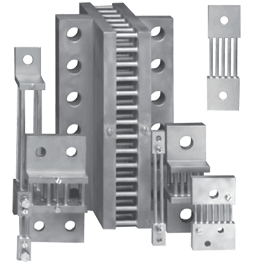 Direct current instrument shunts are used to extend the range of ammeters whenever the flow of current to be measured is too large to be passed through the instrument—it can be manufactured for 1A to 15000Amp. The shunt is a diverter which is used to shunt majority of the current around the indicating instrument. The principle of current capacity using a shunt device depends on computing the small voltage released across a accuracy resistor placed in series with the load. Yokins offers typical parts that provide 50 mV and 100 mV outputs, but can also offer custom output voltages. The very-low-resistance values required for shunt resistors, 10 mΩ at 5 A and just 0.05 mΩ at 1000 A, are provided by Yokins resistive elements.